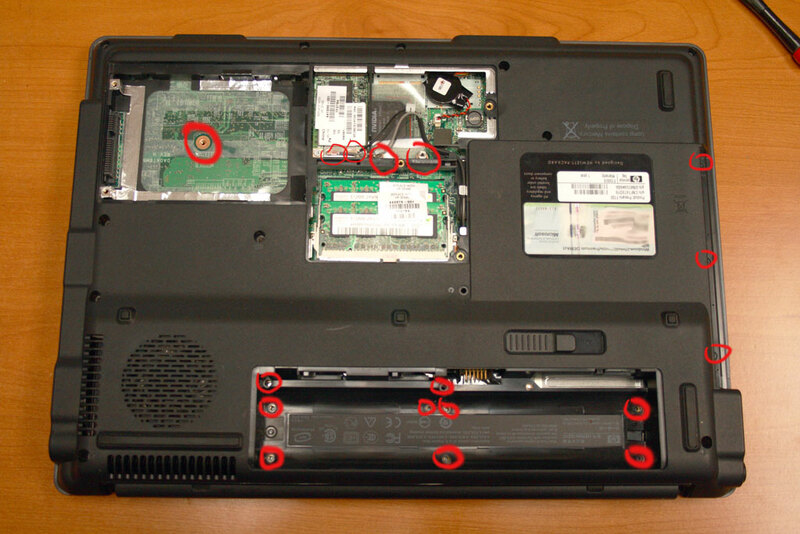 How To Disassemble the Compaq / HP F700 series F730us Laptop Disassembly Tear-Down with photos. 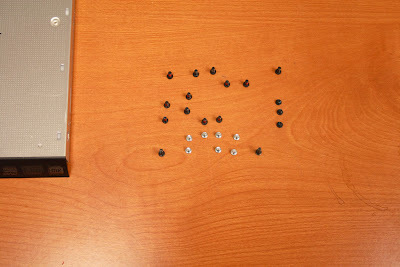 This is a quick post showing a F700 tear-down. 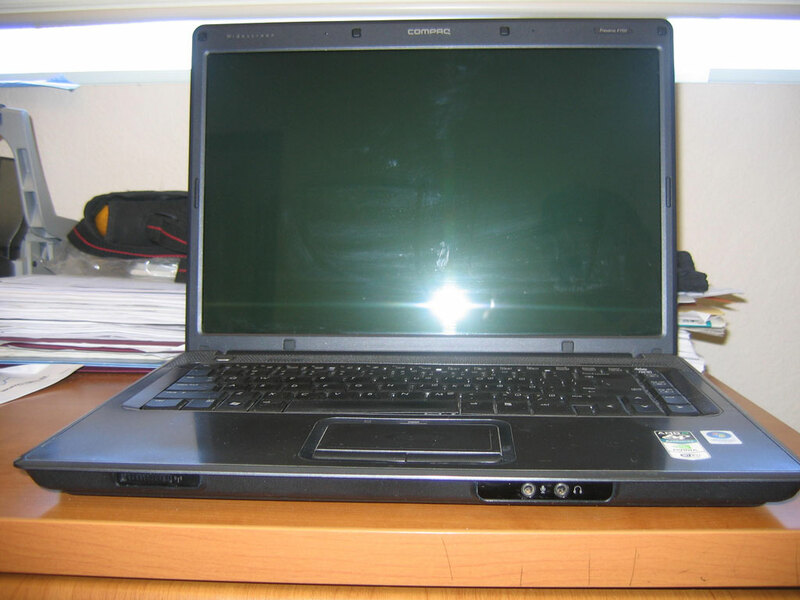 The Compaq Presario line of laptops are almost exactly the same specifications and design as the HP Pavillion DV6000, DV2000, DV9000 series laptops they have just been tattooed as Compaq with the bios and external branding. First you will need the laptop. You should start on the bottom of the laptop with battery closest to you, I have circled all of the screws that you have access to with out taking the battery out or the Memory bay and the hard drive bay. 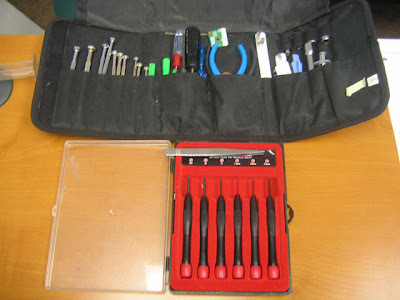 Take the battery out before starting in on removing the screws. 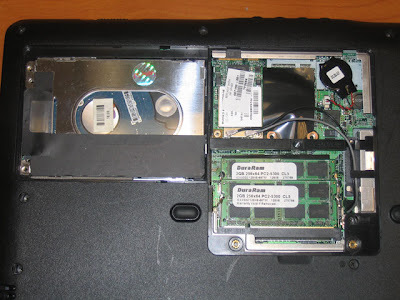 With the hard drive cover and memory cover removed. You now have access to Memory, Wi-Fi, CMOS battery, and the Hard drive and carrie. 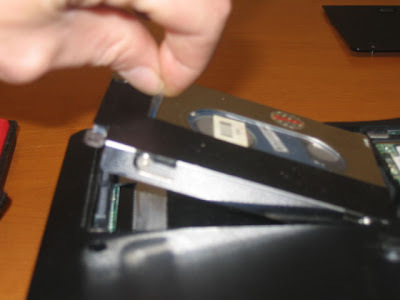 Carefully grasp the plastic on top of the hard drive carrier and pull up .. the hard drive will pop out and place it to the side. Disconnect the Wireless connection now to ensure you don't have to flip it over again to remove them later, as you will need to pull them through the chassis to remove the LCD panel later. There are 6 silver screws in the bottom of the battery bay that hold the power button bezel on and 2 black screws in the bay that hold the keyboard, the keyboard is held in with 3 black screws one is accessible with out taking the battery out. In the memory and wireless bay there are 2 nut type screws that need to be removed at this time as well do not forget these they hold the system board to the chassis. When taking the screws out it is a good idea to keep them in the same relative orientation they came out in. this gives you a sort of map or guide to put them back in. 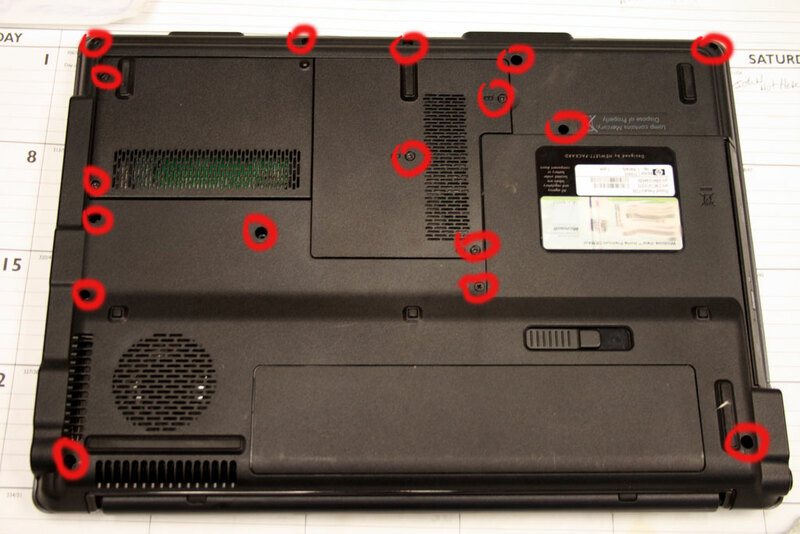 Part 2 will cover taking the Power Button Bezel, KeyBoard, LCD panel, and Top Cover off.